South Fulton is a chartered city in Fulton County, Georgia, United States. It includes all of the land that had remained unincorporated in southwest Fulton County with the exception of the Fulton Industrial Boulevard corridor. The communities of Red Oak, Cooks Crossing, Stonewall, Tell, Fife, (part of) Campbellton, Ben Hill, Sandtown, Cliftondale, and Peters Woods (a few of which were towns founded before the American Civil War) are located in South Fulton. The first mayor of South Fulton is Bill Edwards, who previously served on the Fulton County Board of Commissioners from 2000 to 2014. In 2007, the region voted in a referendum 80% against forming a municipality. 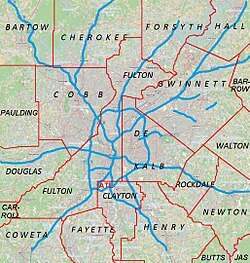 If passed it would have made Fulton County the only county in Georgia to be made up entirely of municipalities. The legislation authorizing the referendum was sponsored by Kasim Reed, then a member of the Georgia State Senate, and now-former mayor of Atlanta. Although the area has many low-density suburbs, it would be called a “city“, the only type of municipality currently allowed under Georgia law. The referendum followed indirectly from the successful incorporation of Sandy Springs in 2005, on the opposite side of Atlanta, with several other communities in Fulton voting to incorporate in 2007. The 2016 Georgia General Assembly passed bill HB514 to incorporate South Fulton, which received the signature of Governor Nathan Deal on April 29, 2016. On November 8, 59% of the citizens of South Fulton voted to become a chartered city. In early 2017, South Fulton held elections on March 21, followed by runoff elections before incorporation took effect on May 1. In November 2017, after a one-year waiting period mandated by state law, the city council selected Renaissance as the new name for the city, also having considered Campbellton (a historic town now partly within the city), Atlanta Heights, Wolf Creek and retaining South Fulton among a total of 20 names out of 250 suggested by the public. Following a three-week public notice period and two regular public meetings, which are required to amend the city charter, the city council approved the name change in December 2017. However, Mayor Edwards vetoed the name change on December 18, citing several reasons including contracts and some public opposition. The city is 90% black, and the court system is run by 8 black women. ^ “City of South Fulton with Proposed Council Districts” (PDF). Gis.fultoncountyga.gov. Retrieved 12 July 2018. ^ “SOUTH FULTON CITYHOOD TRANSITION : TOP 10 FAQS” (PDF). Fultoncountyga.gov. Retrieved 12 July 2018. ^ Cochran, Noreen. “South Fulton votes to become Renaissance, Georgia”. Mdjonline.com. Retrieved 12 July 2018. ^ “South Fulton mayor vetos town changing name to ‘Renaissance‘“. Fox5atlanta.com. Retrieved 12 July 2018. ^ “Eight Black Women Run This City’s Entire Justice System (HBO)”. Vice News. September 7, 2018. Retrieved September 7, 2018.